Step 1: Remove any giblets, then rinse the chicken inside and out with cold running water. Pat dry with paper towels. Rub the outside with 1 tablespoon vegetable oil, then season generously with salt and pepper. Step 2: Set up the grill for indirect grilling and preheat to medium (375 degrees F). If using a charcoal grill, put a large drip pan in the center. Divide the wood chips between the two mounds of coals. Step 3: Place the chicken, breast-side up, in the center of the grill grate over the drip pan and close the lid. Smoke-roast the chicken until it is golden brown and the juices run clear, about 1 hour and 15 minutes. (The internal temperature of a thigh should be 165 degrees when read on an instant-read meat thermometer.) Transfer to a cutting board and let cool. Step 4: Adjust the temperature of the grill to medium-low. Step 5: While the chicken smoke-roasts, heat 1 tablespoon of vegetable oil in a Dutch oven or large pot over medium heat. Add the sausage and brown, turning as needed with a spatula, 6 to 8 minutes. Remove the sausage to a plate lined with paper towels. Set aside. Step 7: Stir in the bell peppers, celery, onion, okra, and garlic and cook, stirring constantly, for 6 to 8 minutes. Slowly add the chicken stock, stirring constantly until the mixture is smooth. Add the bay leaves, Creole Seasoning, and reserved sausage. Bring the mixture to a boil over medium-high heat. Carefully transfer the pot to the center of the grill grate and simmer for 45 minutes, stirring often. Replenish coals as needed and add fresh wood chips or chunks to generate smoke. Step 9: Stir the chicken, scallions, and filé powder into the gumbo and simmer for 10 to 15 minutes. 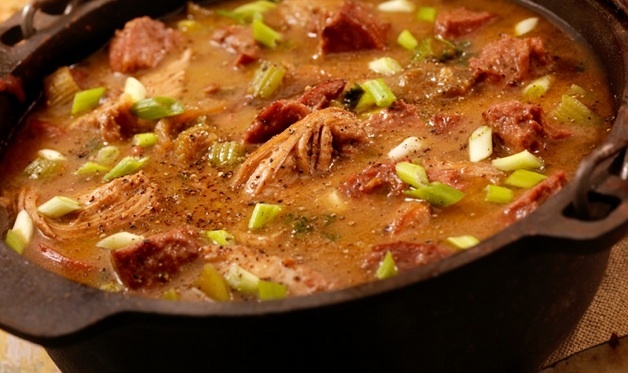 Taste the gumbo, adding more Creole Seasoning or salt and pepper as needed. Remove the bay leaves. Step 10: To serve, mound rice in a shallow soup bowl and ladle gumbo over the top. Sprinkle with chopped parsley and serve with hot sauce.